For all the criticism it gets from the Metal massive, it’s worth remembering that Fear Factory is a legend in the genre, as big as Sepultura or Pantera in its day. Early albums such as Soul Of A New Machine and Demanufacture helped shape nineties Metal in a way that few underground bands can claim, and even the band’s last couple of releases have been respectable, if not up to the standard of the early material. That includes Transgression; although like many outspoken fans your humble correspondent didn’t like it at first, with time it revealed itself as a brave yet flawed strike out for new territory. Frankly, if you didn’t see it coming after the lighter moments on previous album Archetype you must have been deaf. Fear Factory’s future, at the moment of writing, is unknown. Members give contradictory statements in interviews – vocalist Burton C. Bell liked the direction taken on Transgression but the band is on hold, guitarist Christian Olde Wolbers thought Transgression was rushed, and is tracking guitar parts for the new album… as a fan, it’s frustrating to say the least. Contrary to all the pessimists calling for the band’s split, I’m certain that the members have another album in them. Whether Bell wants to continue, though, is another matter. Around the time of the band’s original split in 2002 after original guitarist Dino Cazares left, Bell formed a little-known side project with Front Line Assembly and former Fear Factory keyboardist John Bechdel. 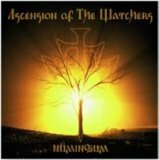 Apart from a limited EP in 2005, Ascension Of The Watchers has produced little until now, with debut full length Numinosum (meaning a mystical experience from ‘beyond’). It’s far from the Cyber Metal that makes up Bell’s day job, too, taking an ambient path with occasional bursts of 80’s Goth like The Cure and Bauhaus, all in all sounding like the mellowest moments from the last couple of Fear Factory albums – Ascension from 2004’s Archetype and Echoes Of My Scream from 2005’s Transgression - taken to their natural conclusion. On them there’s a sense of coming out into the sun after the storm has passed, a new beginning, hope after terror – yet Numinosum lacks the prior ‘heavy’ bits, the storm that gives these moments such grandeur, such an emotional punch. So does it stand up, despite that? Well, yes and no. Being cynical, many will look at the crap artwork and the slightly amateurish feel of the music at times and reject this out of hand, but there’s much to like for the patient. When Ascension Of The Watchers is good, it’s very good, the sparse beats and ambient noise sometimes reminiscent of Jesu. Bell has never been the best of vocalists, but when he makes the effort his voice does pack a punch, and aside from the odd shaky moment such as partway through the Folky Canon For My Beloved where he audibly struggles with some of the lower moments, and the unbelievably twee Violent Morning, it’s a superb performance. Songs such as Evading and On The River are catchy, sparkly moments of sunlight, lifting you above the gloom before plunging you straight back in. Like Falling Snow’s hypnotic backing beats are a perfect match for Bell’s French chanting, whilst sixteen-minute finale Quintessence, with its bells and sampled trains, ends the album on a mysterious note.